Inaccuracies and an unsuitable tone spoil this history of Japan's kamikaze pilots. Wetherall (1986, 43) points out in a review of this book that its "general reliability is marred by errors in historical names and sloppiness in the romanisation of key Japanese words." Wetherall considers The Sacred Warriors, a general history published in 1982, to be "more inspired in every way" than The Kamikazes. Edwin Hoyt is a military historian who has written numerous other books on World War II. 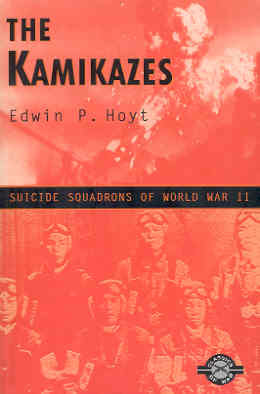 Arbor House originally published The Kamikazes in 1983, and this edition published by Burford Books contains a two-page foreword by Hoyt dated April 1999. Even this new foreword contains several factual errors, and the book's main part still has uncorrected errors from the previous edition. The foreword has the "Russo Japanese War of 1903," even though this war occurred in 1904-5. Hoyt writes in the foreword that the suicide attack as a military policy was invented on October 16, 1944, but two naval officers there at the time indicate the date was October 19 (Inoguchi and Nakajima 1958, 3, 14). The first name of "Takejiro Ohnishi" in the foreword should read "Takijiro," and the main part of the book uses "Onishi" rather than "Ohnishi." Some statements in the foreword have little support. Hoyt writes that "the suicide attack as a military policy was invented on the spur of the moment by Admiral Ohnishi," but Warner and Warner (1982, 68-86) provide much evidence that the Japanese military supported suicide attacks prior to this and that Ohnishi received orders to use suicide tactics in the Philippines. The foreword says, "There is not much talk about Kamikazes in Japan today." This seems to be an overstatement, since over the past decade many books have been published and several commercial films have been released on the topic. Although the book generally gives a correct account of the events surrounding Japan's kamikaze operations, it contains many more examples of incorrect and unsupported statements. Hoyt generally provides a straightforward account of the history of the kamikaze attacks, but at times he uses an unsuitable tone for a historian. For example, he writes of the "sad little letters" that squadron commanders wrote to families of missing fliers (p. 152). This may be an attempt at sarcasm, but the use of "sad little" would probably disturb family members who received such letters. The following unsupported statement seems insulting, "Japanese people are by nature melancholy, or at least mercurial" (p. 36). This is given as one of the reasons why Japanese soldiers readily accepted the idea of owing their lives to country and emperor. As a final example, Hoyt writes of staff officers of the Fourth Air Army "abandoning their geisha friends" as they prepared to fight as infantrymen in the Philippines due to lack of aircraft (p. 168). This side comment about "geisha friends," even if it were true, seems totally irrelevant to the historical narrative. Anyone interested in an evenhanded history of Japan's kamikaze pilots should skip this book and try The Sacred Warriors by Denis and Peggy Warner or Kamikazes by Earle Rice Jr.
Inoguchi, Rikihei, Tadashi Nakajima, with Roger Pineau. 1958. The Divine Wind: Japan's Kamikaze Force in World War II. Annapolis: Naval Institute Press. Wetherall, William. 1986. Universal divine wind. Far Eastern Economic Review. 27 February, 43-44.